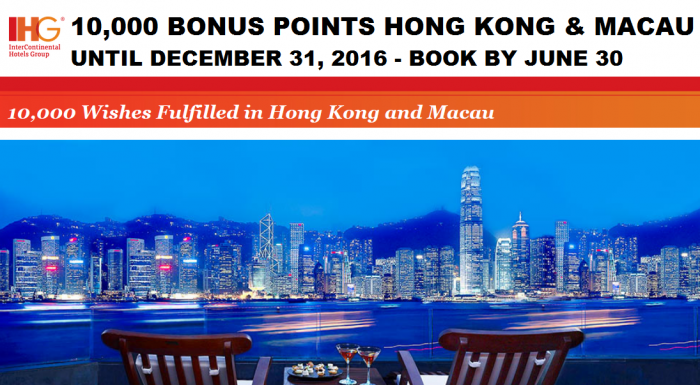 IHG Rewards Club has extended the 10,000 bonus points per stay of 3 nights or longer in Hong Kong or Macao until December 31, 2016. You must book minimum of two nights in advance or by June 30, 2016, and book the 10,000 bonus points rate that is tied to the Best Available Rate. Note that the minimum stay requirement is just two nights at the Holiday Inn Macau Cotai Central. Booking this rate plan makes sense as long as there are no discounted rates available for the dates in question or the discount is less than the value of 10,000 IHG Rewards Club points. The hotel occupancy and average daily rates have softened in both Hong Kong and Macau after the onslaught of tourists from mainland has slowed down. Eligibility: This promotion is only applicable to guests who have obtained IHG® Rewards Club membership (“Members”) at the time of booking. Promotion Period: This promotion is applicable only if bookings are made between 11 June 2015 and 30 June 2016, and stays are completed between 13 June 2015 and 31 December 2016. 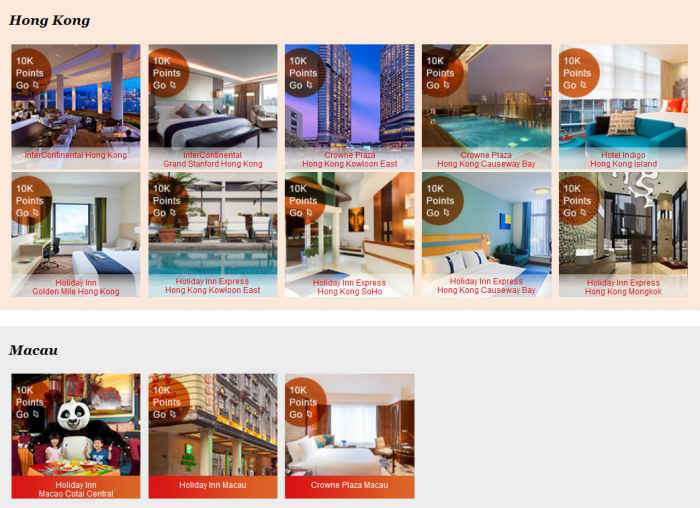 Participating Hotels: This promotion is applicable to all IHG operated hotels in Hong Kong and Macau. Please visit the official webpage of this promotion for more details and a complete list of participating hotels. Bonus Points: During the promotion period, Members will receive 10,000 bonus points in addition to the standard IHG® Rewards Club points (“Points”) after each qualifying stay (see below for details of the qualification requirements). In addition to other requirements specified in these terms and conditions, participants of this promotion must also meet the following requirements:(a) Members shall book through IHG’s official websites, or by calling the participating hotel or our reservation hotline 4008840888. (b) Pre-payment of the accommodation charges of the first night is required at the time of booking and is non-refundable when cancellation or changes are made less than 2 days prior to the arrival date. (c) A qualifying stay must include at least three consecutive nights at the same hotel in Hong Kong or Macau, or at least two consecutive nights at Holiday Inn Macau Cotai Central. If a Member stays for more than three consecutive nights in Hong Kong or two consecutive nights in Macau, it will count as one stay regardless of frequency of check-in/out. All consecutive nights at the same hotel shall be deemed as one stay. (d) Only one Member per room will be awarded the applicable bonus Points. Only one room will be credited per Member per stay, regardless of the total number of reservations and the total amount of accommodation charges paid by the Member. Other Rules:(a) The package rates are per room per night (room only). Tax, service charges and other incidental expenses may apply on top of the Bonus Points Package rates. Room rates will be billed in local currency. Aforementioned rewards may be subject to tax liability, which is the sole responsibility of the Member. (b) Rooms are not transferable. This promotion applies only to the Member’s personal room. (c) Applicable Bonus Points Package rates are subject to availability and are made available on a first-come, first-served basis. (d) Members may participate in the promotion concurrently with “Accelerate” (subject to its terms and conditions separately available on relevant campaign webpage). Languages: These terms and conditions were originally prepared in Chinese. If there is any discrepancy between the Chinese version and any other language versions, the Chinese version shall prevail. Miscellaneous: This promotion is subject to standard IHG® Rewards Club Membership Terms and Conditions (for more details, please visit www.ihgrewardsclub.com). IHG reserves the right to cancel or in any other way dispose of a Member’s Points according to these terms and conditions and IHG® Rewards Club Membership Terms and Conditions if fraudulent use of the promotion is detected.